Yesterday was a dyeing day. I needed more blue and had totally run out of pink. 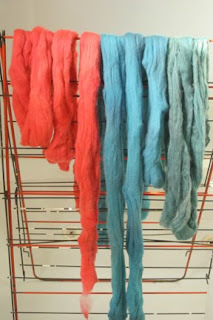 Most of the dyeing I do is with food coloring. I've found color mixes I like, and I appreciate that the mordant used with food grade dyes is vinegar, which is easy on the environment. 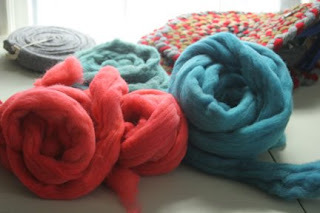 My daughter and her housemate found that they both had moms who are fiber freaks, and within minutes they commiserated with each other about the dyed wool hanging on racks in the bath tub. This photo is for them!